Apparently closed. Looking through the window, I could see that all furnishings except for the altar, font and pulpit (all 19th Century) have been removed , and the church filled with modern tables with chairs around them, a top table in the chancel with white board, etc. Now a meeting and conference centre, perhaps? Certainly no keyholder notice. 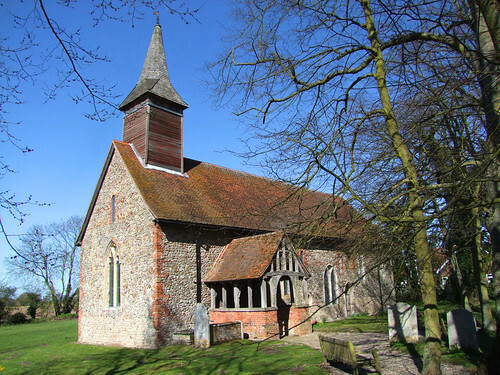 Externally, a pleasant enough small Essex church with barge-boarded bell turret. Much evidence of its Saxon/Norman life in the walls. A pretty village, too.